Let's talk about magnet implants. I don't really bring it up much, but I have a small rare earth magnet implanted in the pinkie finger on my right hand. I've had it for around three years now. Whenever someone finds out that I have this implant, they've always got a ton of questions. Usually the first question is "why?" While this is a valid question, I tend to dismiss it when asked, favoring a continuation to the conversation rather than a Q&A session about my motivations and the way in which I view and interact with the world. But to be fair to those who are genuinely curious (rather than those who quickly ask "why?" out of shock), I figured I'd share some of my thoughts and experiences related to having a magnet implant and hopefully answer some of the frequently asked questions. If you have any additional questions, feel free to leave a comment or send me an email. Note: I am not going to tell you where I had mine done, nor do I know where you can get one. Sorry. When I first read about magnet implants the technology was still in its infancy. There was an amazing article by former editor and founder of BMEZine Shannon Larratt (forgive me for not being able to find that specific article) that discussed a type of "sixth sense" that these magnets provided. But my interest in getting the procedure myself was quickly squashed after reading and seeing, in graphic detail, what happened when the silicone encasing around these magnets broke down and the magnet corroded inside his finger. Even after all these years, just the thought of those images gives me the chills. At that time, I wrote the procedure off as a cool concept and nothing more. It wasn't until around three years ago, in a bar with some friends, that I learned that one of my buddies actually had a magnet implant. Not only did he have one, but had it for a year at that point. My interest was immediately piqued again. No longer was this just some procedure that someone tried and failed. Rather, it had a bit of staying power. I spent the rest of the night talking to him about the implant and watching him perform party tricks, such as picking up paperclips and bottle caps with the tip of his finger. That night, I made the decision to get the implant. The next day, I contacted my local experienced implant practitioner and made an appointment. The first decision I needed to make was which finger to get the implant. I had already chosen to get the implant on my right hand, as I am left handed. I ended up settling on my pinkie finger after performing a bunch of routine tasks and paying attention to which fingers I used most. Another common finger for the implant is the ring finger, but I felt like I used my pinkie less, so I opted for that one. The actual implant procedure was fairly quick. My finger was marked in two places: where the magnet was going to go as well as the incision spot (around a quarter to a half inch away from the final resting spot for the magnet). He then made the incision with a scalpel, used some tissue elevators to separate the tissue, slid the magnet into place, and sealed the incision with some surgical glue. Next was a bit of tissue compression; then my finger was wrapped up and I was on my way. It took about fifteen to twenty minutes total. Due to the tissue trauma from cutting open my finger, it took a while before I could really take full advantage of having the magnet implant. It was only a day or two before I picked up my first paperclip, but it took a few months before my finger really regained full sensation. The tissue around the implant all the way up to the incision point was swollen and fairly numb for weeks after the procedure. 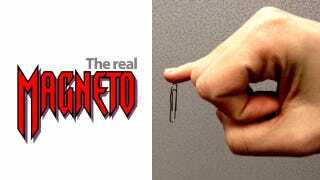 This didn't stop me from playing with the magnet all the time, picking up paper clips and other small metal objects. As the swelling went down and the sensation in my finger tip came back, I began to experience elements of an invisible world around me. When people discuss magnet implants giving a "sixth sense," this is what they're talking about. I was working retail at the time, and I believe the first thing I noticed was the vibrations from the fan inside the cash register. I could feel the invisible field, coming out of the side of the computer in a half-dome. The vibrations varied in strength depending on where I held my finger. It really did not feel like a foreign object vibrating, but rather my finger itself. It was an extremely weird sensation and fairly uncomfortable at first. Another uncomfortable experience, which I quickly learned to avoid, was handling other magnets in such a way that they flipped the magnet inside my finger. The magnet inside my finger is round and flat, so introducing an outside magnet with a different polar pull would cause my magnet to make a quick flip inside my finger. While this didn't hurt, it was (and still is) fairly uncomfortable. In addition, sometimes the magnet would get pulled on it's side, sticking up and down rather than settling flat in my finger. This never hurt either, but also proved to be quite uncomfortable and required a quick massage to get the implant to lay flat again. I quickly learned that magnetic surfaces provided almost no sensation at all. Rather, it was movement that caused my finger to perk up. Things like power cord transformers, microwaves, and laptop fans became interactive in a whole new way. Each object has its own unique field, with different strength and "texture." I started holding my finger over almost everything that I could, getting a feeling for each object's invisible reach. Portable electronics proved to be an experience as well. There were two fairly large electronic items that hit the shelves around the same time as I got my implant: the first iPad and the Kindle 2. Both of these items had a speaker located at the bottom right of the unit, almost exactly where I rested the pinkie finger of my right hand. Both of these speaker magnets were powerful enough to flip the magnet in my finger if I brushed past them in a certain way. This was incredibly annoying, but became a moot issue as soon as I put a case on either device. No elements of the iPhone ever posed an issue, and newer versions of the Kindle and iPad moved this magnet to an non-intrusive location. I was very wary of the iPad 2′s magnetic smart cover, but these magnets are so specifically targeted that they take a while to find even if you're looking for them. The best part of having the magnet implant was discovering invisible magnetic fields when I wasn't actually looking. The first experience I had with this was walking through the intersection of Broadway and Bleecker in Manhattan. I passed through this intersection a few times before realizing that my finger would tingle at a certain spot. After paying a bit more attention, I realized that I was feeling something underground. At first, I assumed it was a subway car, but later came to the conclusion that it was most likely the subway power generator, or the giant fan that was cooling these generators. After noticing these underground waves at Broadway and Bleecker, I began feeling them all over Manhattan. Another unexpected magnetic field is at certain store checkout counters. Mainly at book stores (and some clothing stores), there is a strong unit under the counter that removes the security tags. This unit usually pulses, sending out magnetic waves strong enough to be felt a few feet away. This always leads to interesting conversations with the cashiers. There are surprisingly few downsides I've experienced in the three years that I've had the magnet implant. Luckily, the magnet is not strong enough to wipe out credit cards nor will it negatively affect electronics or computer monitors. I've also flown numerous times since having the procedure done and never had any issues. The only real negative aspect to having this implant is the inability to get an MRI (if needed) without first having the implant removed. This is something that I thought about before getting the procedure done and I made a conscious decision to get the implant anyway. I also figure that if I'm ever incapacitated and put in an MRI machine without the ability to give the doctor any forewarning, a tiny magnet getting ripped out of my finger will be the least of my concerns. Three years after getting the implant, my magnet is something that I constantly forget about. It's not something that tends to come up in general conversation. Even the prompt, "Tell me something unique about yourself" often occurs in an environment where mentioning a magnet implant may be slightly inappropriate. As far as my personal use of the magnet, it servers as more of a general curiosity tool rather than having any sort of practical use. I'm not in a profession that requires me to tell live wires from dead wires. Rather, if I find an object that's labeled "magnetic," I'll generally hold my finger up to see the exact strength of the magnet and nothing more. Over the years, the magnet has lost strength as well. While I could once hold a large paperclip, the magnet now only supports a small one. The combination of a weaker magnet and the novelty wearing off means I rarely even think about the implant. It's only when I sense a fairly strong field that the magnet will enter my consciousness, and even then, it's usually a quick mental note before I continue doing what I was doing. Despite this, I'm still really happy that I had this procedure done. It has unlocked an entirely new world for me, one that I can touch and interact with in a very real way. While a magnet implant doesn't technically count as a "sixth sense" (it's more of an extension of our existing sense of touch), the way that the body internalizes these tiny magnetic vibrations feels truly foreign. If this is something that you're interested in getting done, by all means continue your search. Make sure to do your research, find an experienced practitioner, and know the supplier of the magnet. Understand the risks and the consequences of getting a magnet implant. Once you've done all get, go get the magnet and start exploring the world. Dann Berg writes about technology and internet trends at IAmDann.com. You can also tweet him @DannBerg.